Before dawn, thousands of nuns, monks and laypeople filed through the security checks into the Monlam Pavillion for the first day of the 33rd International Kagyu Monlam. All those who walked along the road passed under a simple welcome gate. Made from cloth and plywood mounted on a wooden frame and painted in a pinkish sandstone colour, the gate is designed to be a fusion of temple traditions rather than one particular style. Below its lintel, multi-coloured prayer flags display the dhayani mantra of Akshobhya Buddha, which has the power to purify all those who pass beneath. A large sign declares “Welcome” in Tibetan. 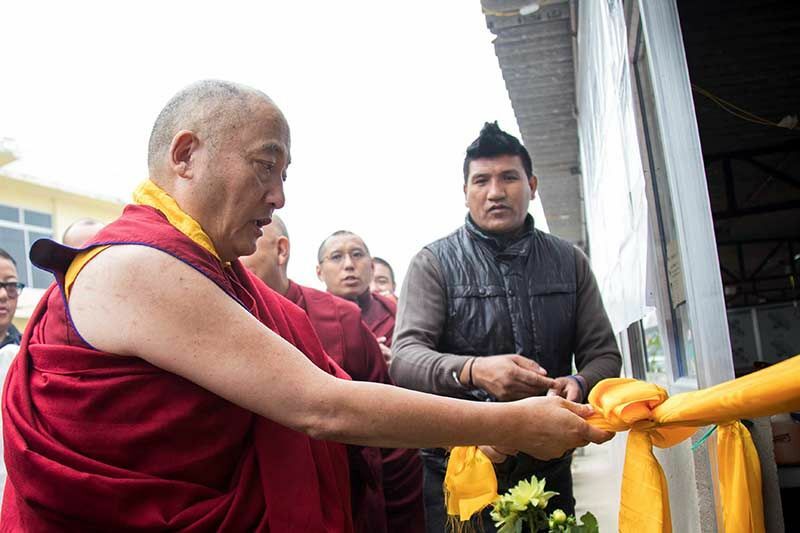 While people were gathering in the pavillion, HE Jamgon Kongtrul Rinpoche visited the Mahabodhi Stupa in order to make offerings to the Golden Buddha on behalf of the Karmapa, to create auspiciousness for the Monlam. Shortly after 6.00am, His Holiness the 17th Karmapa arrived at the pavillion to bestow the Mahayana Soljong vows. He sat on stage facing the congregation and asked everyone to take the vows with the pure motivation that they were taking them for the sake of all sentient beings. After the vows, he spent a little time clarifying the eight precepts that accompany them. 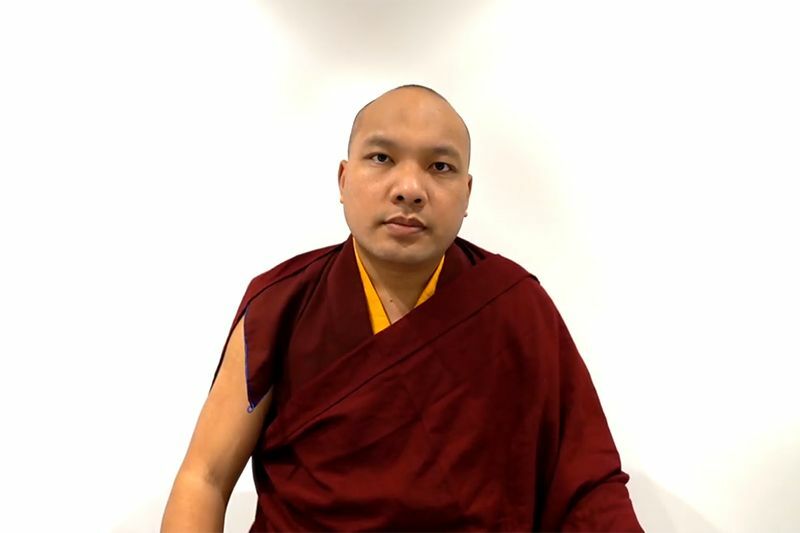 He explained that monastics and laypeople who hold vows should take the Mahayana Soljong vows with the resolve of bodhichitta and pay careful attention to keeping them. He then gave some advice on how to interpret them. For instance, the prohibition against using high seats, designated as above a cubit in height, does not extend to people staying in hotels where there is no choice over where they sleep. In that case it was not necessary to sleep on the floor in order to keep the Soljong vows. Likewise, those who have diabetes or need to take medicine with food and so forth, are excused from keeping the vow which restricts eating to before noon. On the other hand, abstaining from sexual activity is an absolute, and the correct interpretation of the ban on perfumes, necklaces, song and dance concerns avoiding the things we do in order to enhance our attractiveness to others. The Soljong finished as the sky lightened over the first day of the 33rd Kagyu Monlam. His Holiness continued his address. 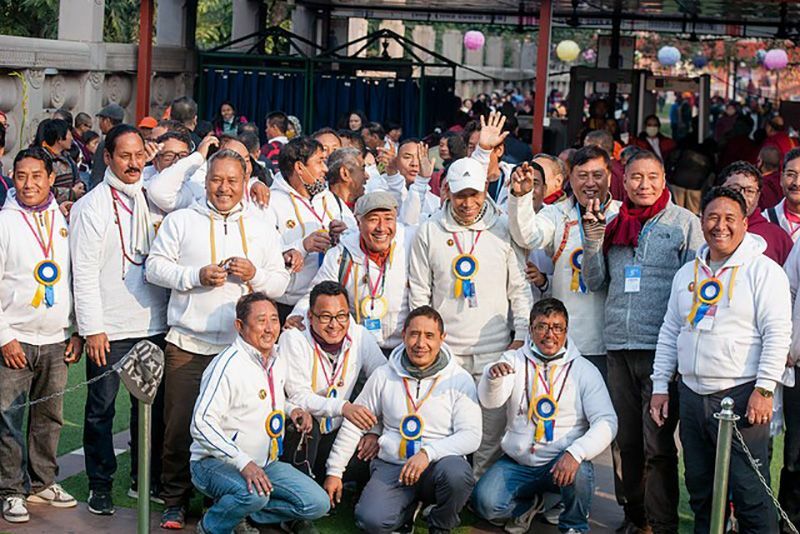 As Kagyu Monlam is an annual event, he explained, it affords us a unique chance to take stock of the year which has just gone. We can make the aspiration to continue doing the good things we have done and we can generate real remorse for our mistakes and misdeeds, and resolve not to do them again. He then turned his attention to the monks and nuns and warned them to keep a pure motivation and fulfil their responsibilities. Out in the world, he said, people work and then they get paid. The purpose of becoming a monk or a nun is not to have good food and clothing or to become popular but to spread the Buddha’s teachings. We can’t all be like Milarepa and give up food and clothing…but keep in mind your responsibilities. The monastic codes aren’t just something to be done, but something to be done enthusiastically. Similarly, householders, should always remember the precepts, maintain good behaviour and not commit any harm. The Soljong section was complete. Deftly His Holiness’ seat was rearranged to face towards the Buddha, and the Three Daily Observances in Sanskrit began: Taking Refuge in Buddha, Dharma and Sangha; The Sutra of the Recollection of the Three Jewels; and The Sutra of the Heart of Transcendent Wisdom. On the top tier of the stage, stood the new eighteen-foot high Buddha, clothed in robes of golden silk, edged with red. The altar to the Buddha’s right held two large tormas, displaying images of the Karmapas, the eight auspicious symbols, and seven offering bowls. The altar to the Buddha’s left held two more tormas displaying images of the Karmapas, the seven articles of kingship, and seven offering bowls. Two tiers below was the wooden pagoda style shrine which contains an image of the infant Buddha, decorated with garlands of flowers in yellow and lavender. Either side of the shrine, in place of the more usual butter lamps, circles of smokeless candles burned brightly in two special containers. 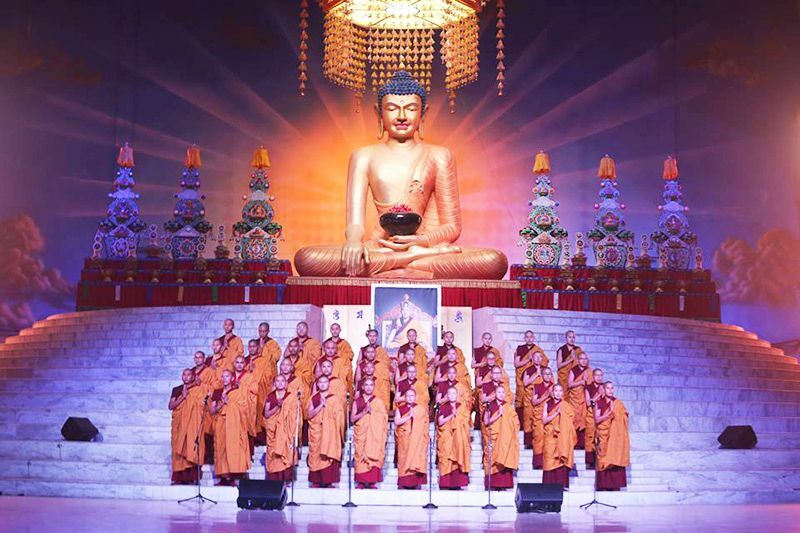 On the stage behind His Holiness sat the Rinpoches and Khenpos. 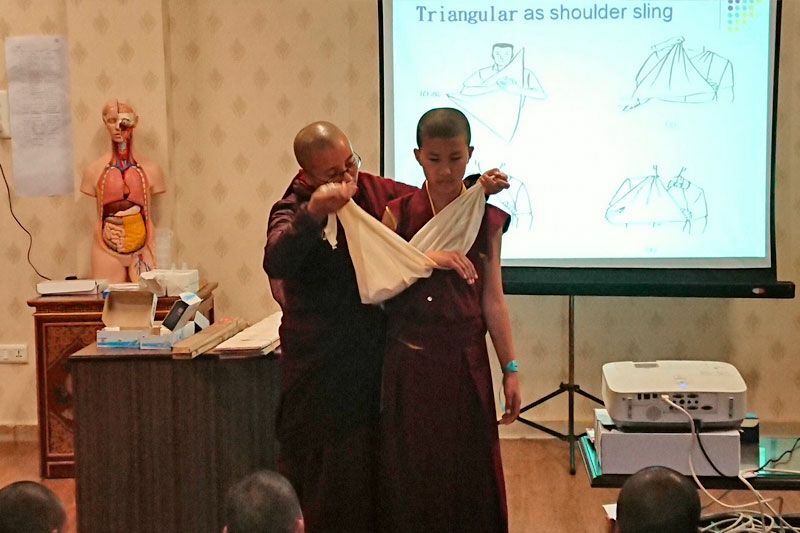 On the tiered wings to either side of the enlarged stage, sat the fully ordained sangha, both monks and nuns. After a short break for a breakfast of butter tea and bread, the morning ritual continued with the Twenty Branch Monlam. The two new high definition screens mounted either side of the enlarged stage, enabled everyone in the vast auditorium to watch as the Gyalwang Karmapa invited the Buddhas to come and made the offerings which traditionally would have been accorded to visiting royalty in Ancient India: perfumed water for bathing, drying the body with soft cloth, offering robes, and anointing with perfumed oil. Finally, before the Sutra in Three Sections was recited, His Holiness gave a short explanation. The sutra comes from the 22nd section of the Ratnaguta Sutra which was taught by the Lord Buddha at Shravasti in the presence of 500 arhats and 1000 bodhisattvas. There were different interpretations of the three sections but the most common view was that the three sections were prostration, confession, and dedication. The sutra began with refuge prayers so that we would remember the qualities of the Three Jewels. There was a method, described by Naropa and Tsongkhapa, of including the names of the buddhas in the section on confession. This was used by the bodhisattvas as the main practice on the path, and was particularly important for confessing downfalls of their bodhisattva vows. If we know how to practise this sutra correctly, all the practices are complete within these three sections, and the sutra has the power to bring us all the way to the state of perfect enlightenment.